Last weekend was the first Club Ride Century where a 100 mile route was being attempted. I was unsure how popular this ride would be. I received four apologies which was encouraging as they couldn’t come due to other commitments. 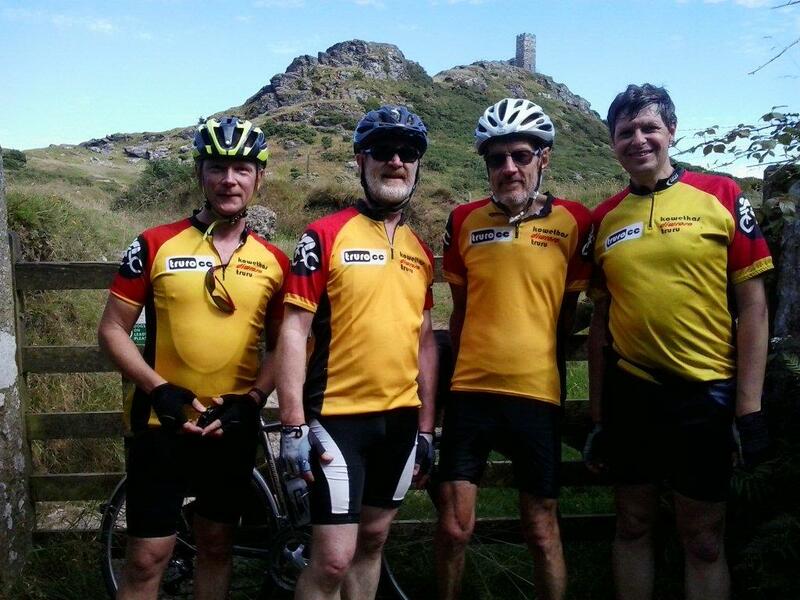 I was delighted to discover six cyclists were keen to begin the ride…we welcomed Rachael and Richard who were new to the club and wanted to come along for part of the adventure. The speed through the Ladock valley and on the old A30 through Victoria was quite fast with Rachael and Richard setting the pace. By the time we reach the camel trail we were averaging 16 mph. Our first stop was at the Snail’s Pace Cafe which is a lovely gem situated at the end of the Camel Trail. Richard, a keen mountain cyclist, left us to head back to Truro as the rest of us continued (after refuelling on great coffee) to tackle Bodmin Moor. With the blue skies, you couldn’t help admiring the vastness and wilderness of the Moorland. The mileage was approaching 40 as we encountered the flock of panicking sheep who heard a sound of a bike bell and began running ahead of us on the country lane. How do you pass a number of petrifying sheep? Fortunately they met a vehicle coming in the opposite direction, now that confused them! After saying our goodbyes to Rachael we continued our ride cycling south into a strong head wind, before turning left heading to Launceston via Egloskerry. We reached the half way stage as we skirted north of Launceston and headed to the Lifton Farm Cafe via a slight deviation from the original route (due to a missed turning). After checking we still had the energy to continue with the 100 mile challenge, we left the welcomed café with excellent friendly service (watching the staff clean up our broken crockery) and cycled east on the old A30, climbing to Lewdown, then we turned right into a country lane and left for some more climbing to Lydford. We all admired the magnificent view of the Dartmoor tors stretching in front of us as we entered Lydford. The ride took us past the gorge and we climbed to the bottom of Brenton Tor which must be one of the most impressive rock outcrops in Dartmoor with St Michaels Church at its top. As we cycled towards the tor we could make out the distinctive and famous silhouette on the Dartmoor skyline. As this was also the highest point of our trip, we took a slight break for a photo opportunity. It was downhill into Tavistock and we all felt we needed another cafe break so we headed to the Original Pasty Shop for refreshments. The town was quite busy. At the café a couple saw our Truro CC shirts and were amazed we cycled all the way from Truro…this was followed by how they enjoyed the Land’s End Firework Display which my Son had composed the music and wrote the storyline for! It was 4.30, our train was at 6.25 and we had approximately 20 miles to go, so we left Tavistock searching for Drake’s Trail which was going to take us to the outskirts of Plymouth. The first few miles of the trail had a slight incline, even across the viaduct. However, once we got over the steepest part of the trail, we discovered a path which I must say was an excellent route for cyclists for scenery, nice path surface and two old railway tunnels which were very long and very drippy, one of these we couldn’t see the exit as you entered because of the curve. We arrived at Plymouth Station at 6.15pm after what must be one of the best cycle rides I have experienced in the South West with regard to the distance and the route (with its ever changing scenery). A special thanks to Chris F, John B and Damien for their company. Good job you planned in the missed turn….or else we would have been short of the 100 mile target!